Hi again. As per my previous blog entry, I'm still pounding away on the book and on my other projects, as per the handy widget on the right side of the blog. I'm also bringing back The Amazing Surprise Ten Buck Forecast Experiment and, although Version One was incredibly popular, this time it's back with a slightly improved twist. Check it out if you haven't seen it before... it's pretty cool, even if I do say so myself. We are now experiencing a conjunction between Jupiter and Neptune, which is something that only hits about once every twelve years. The ideal way to deal with this -- the fusion of philosophy and mysticism -- would probably be to go off into the woods, eat some mushrooms, and hallucinate a new direction in life. Unfortunately, modern society doesn't tend to encourage the consumption of hallucinogens, even if it's in an important and time-honored spiritual context. And even if your boss does let you have the time off, good luck getting your medical coverage to pay for the psilocybin. So I've decided to provide the best substitute for you I can come up with on a blog. Achieve Enlightenment now... thank me later. Is there a God? Even if you aren't all that sure, odds are good that your answer will tend to either a "yes" or a "no." Either way, think about it for a moment. Inescapably, all reason and evidence points to the utterly unnecessary nature of a Creator. IF YOU DON'T BELIEVE IN GOD: If you were God, and were going to have a child (The Universe)... wouldn't you want that child to be as self-sufficient as possible? 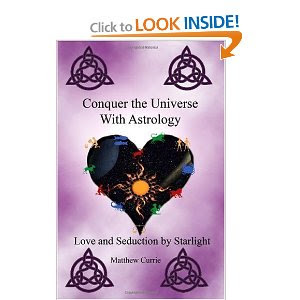 Conquer The Universe With Astrology! I'm about to vanish from here for a couple of months or so. I'm pleased to announce that Llewellyn will be publishing my forthcoming book, "Conquer The Universe With Astrology" and with luck it will be on the shelves by December. Getting the book done is going to require a lot of heavy typing from me in the next couple of months, and there are other projects in the works as well. So, if your only exposure to my work is here on this blog, my output is going to seem awfully slim. There will be three primary signs that I am still alive. First of all, there is the Astrology.com blog, which will automatically reprint here. But really... you should go HERE and scroll down the left-hand side and click on "subscribe." It will be best for both of us. There's also The Daily Sky at Sasstrology.com. And there's Twitter, where I am "matthewcurrie." 7) Get Laid And Avoid Paternity Suits With Astrology! 1) This Book Is Already Worth Fifty Bucks On EBay! In the meantime, you may also see something or other here, on occasion. And now, if you'll excuse me... I have some typing to do. Thank you, and bless you all. I'll be back.